Unify your logging strategy. There’s no need to sync between logging systems, agree on dependencies, or risk breaking code in other containers. Monitor your Docker environment in real-time based on container events, configuration information, and host and daemon logs. Use advanced analytics such as outliers and anomaly detection to easily find and troubleshoot issues in your Docker infrastructure. Docker containers represent the new way of packaging an application, along with all of its dependencies, into a standardized unit for deployment. According to a O'Reilly survey, one of the top challenges impacting Docker adoption is the difficulty monitoring Docker containers. Clearly, performance and availability cannot be allowed to suffer as applications are containerized. The key for the successful deployment of applications in containers? The continuous monitoring of the Docker environment. Traditional Linux-based tools that are designed to run on a single host and that rely on analyzing log files on disk don’t scale well to multi-container clustered applications. They don't work especially well monitoring single-container apps because, unless they are written to a data volume, disk contents are not persisted when containers are shut down. 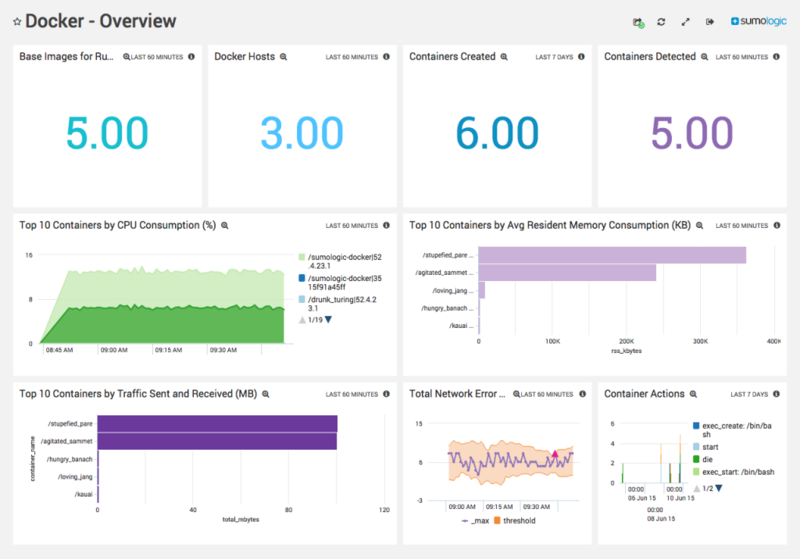 What you need is a centralized approach to log management using container-aware monitoring tools. Sumo Logic delivers a comprehensive strategy for the continuous monitoring of Docker infrastructures. You can correlate container events, configuration information, and host and daemon logs to get a complete overview your Docker environment. There’s no need to parse different log formats or manage logging dependencies between containers. 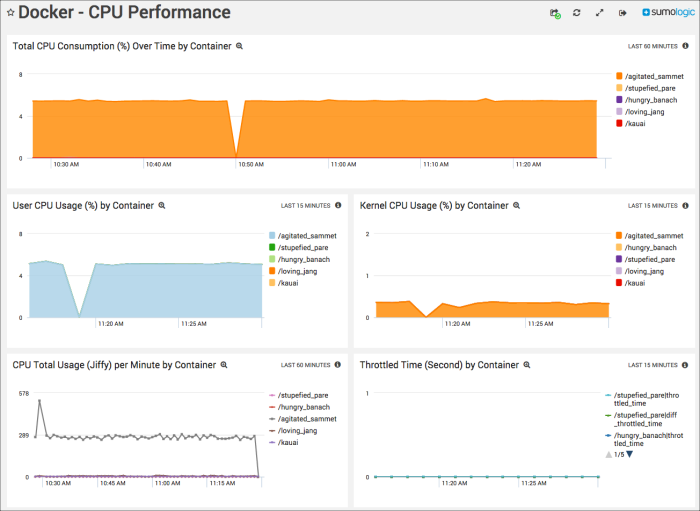 With the application’s quick and easy analysis tools, you can quickly view top 10 active containers by memory consumption, CPU consumption, or traffic sent and received. 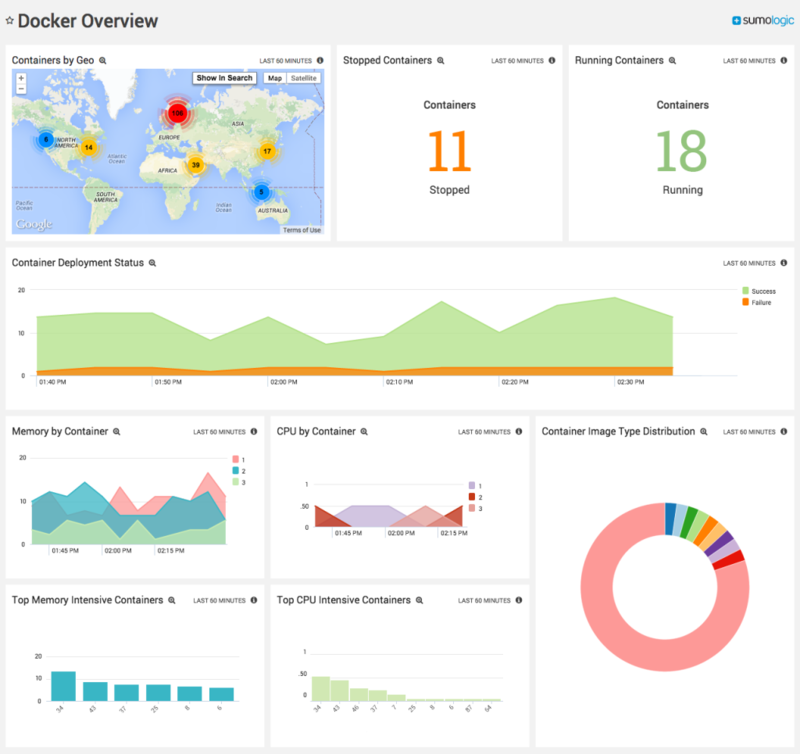 Sumo Logic's integration for Docker containers enables IT teams to analyze, troubleshoot and perform root cause analysis of issues surfacing from distributed container-based applications and from Docker containers themselves. Native collection source for the entire Docker infrastructure. Real-time monitoring of the Docker infrastructure, including stats, events, and container logs. 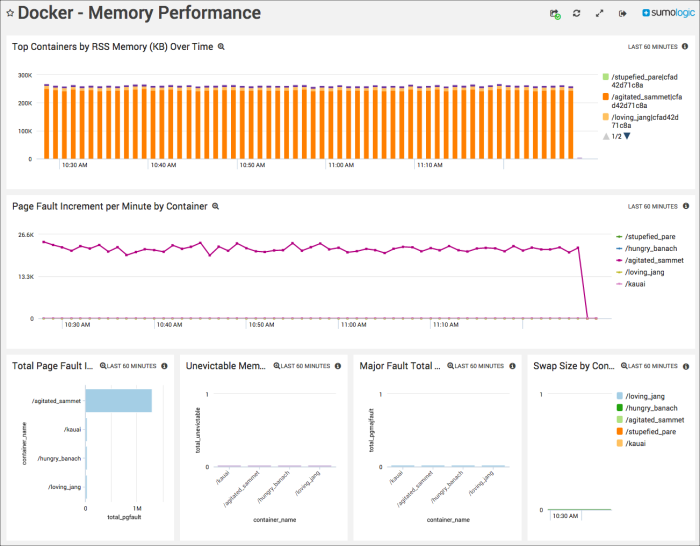 Ability to troubleshoot issues and set alerts on abnormal container or application behavior. Visualizations of key metrics and KPIs, including image usage, container actions, and faults, as well as CPU/memory/network statistics. Ability to easily create custom and aggregate KPIs and metrics using Sumo Logic’s powerful query language. Advanced analytics powered by Log Reduce, Anomaly Detection, Transaction Analytics, and Outlier Detection. 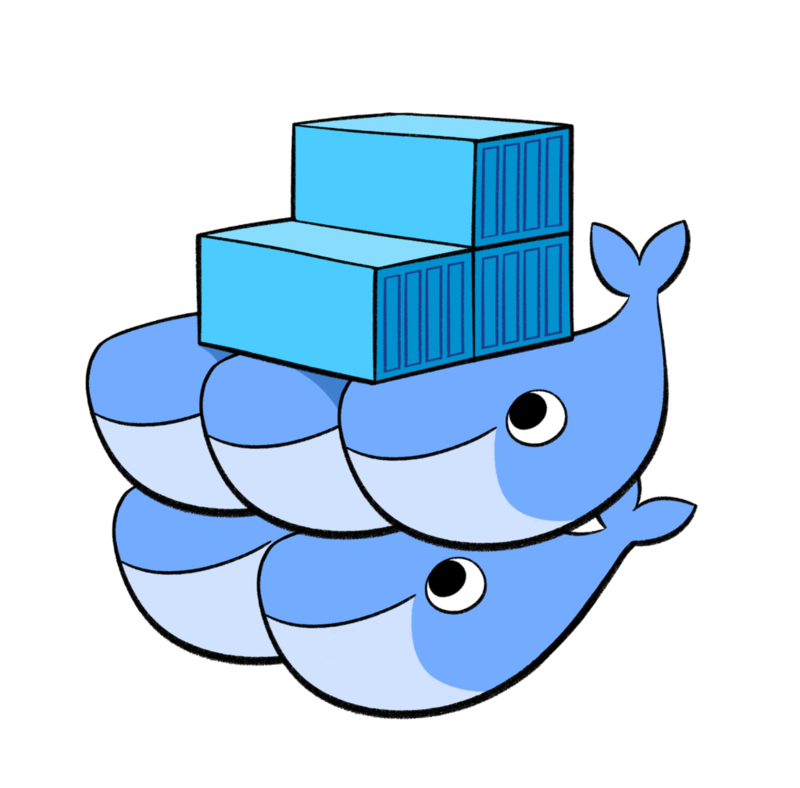 The Sumo Logic App for Docker uses a container that includes a collector and a script source to gather statistics and events from the Docker Remote API on each host. The app wraps events into JSON messages, then enumerates over all running containers and listens to the event stream. This essentially creates a log for container events. In addition, the app collects configuration information obtained using Docker’s Inspect API, and collects host and daemon logs, giving developers and DevOps teams a way to monitor their entire Docker infrastructure in real time. “As an engineer working with complex and containerized applications, monitoring and troubleshooting the health of both the application and container infrastructure is imperative,” says Caleb Sotelo, entrepreneur and director at OpenX Labs. Take a tour of Sumo Logic's log management tools and check out the new standard in machine data analytics.